May was a fun month. We got on the road and left Florida, first stop Sun City Hilton Head where we presented a Picasa seminar to the computer club. They asked that we talk about making collages (like the picture at right), so we put together a whole new seminar. It was so fun, and worked so well, that we will be presenting it at some of our other appearances this summer. We will also be making a set of videos for our members just on collages. If you are a paid member, expect a notice within the week for a ‘Short-Course’ on Collages. After leaving Hilton Head, we traveled to NW South Carolina and a Thousand Trails park called Carolina Landings. We are staying here for two weeks, doing lots of catching up on email and website updates, tutorial videos, and articles. We also set aside a couple of days to be tourists in the area. There is a fish hatchery nearby, one of my favorite types of places to visit! 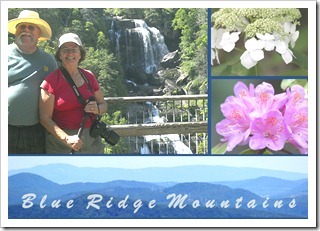 There is also a gorgeous waterfall, just over the North Carolina border (pictured above.) We visited it after a 6 mile hike … I’m so proud of us! We actually got away from our computers for nearly a whole day! To see everything on our schedule, check out our monthly calendar. In addition to RV Rallies we will also be at some computer clubs in upstate New York in July, and the Quad Cities area of Illinois / Iowa in August. The next event coming up is a Good Sam RV Rally, called The Rally. Check it out – The Rally’s website has devoted a whole page just to Geeks On Tour! We will be presenting several of our regular seminars as part of the Rally admission from June 21 – 24. Plus we will teach two hands-on classes on June 20; Photo Editing with Picasa, and Smartphone Basics. Bring your laptop or your iPhone / Android and see just how much you can learn in a Geeks on Tour workshop. Pre-registration is required. Google+ account names and how to contact Google. What if I lose my Camera? Timeline is one of the latest changes in the ever-evolving world of Facebook. It is a new way to view your profile. It is different. Every time change happens, a vocal segment of users wail and gnash their teeth, complaining that now they will be inconvenienced and their privacy will be compromised. Whenever Facebook makes a change, scammers will try to capitalize on those resisting the changes, wanting to retain the "old way." Last year, on July 7, Verizon ended the unlimited data plan for new customers. This year (we don’t know exactly when) they will end it for existing customers. Meaning, if you have an unlimited data plan now, when you upgrade your phone and sign a new 2 year contract, you will lose that unlimited data – there will be no ‘grandfather’ rights. 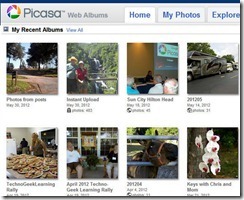 Question: How does one DELETE (permanently) pictures in Picasa?